The Profi Pond Heaters have a fully calibrated Thermostat for easy control of the temperature you wish to run your pond water at. The Profi Pond heater is a real professional piece of equipment and comes with a two year guarantee. This is also an ideal emergency back up for any gas heated pond. Giving you peace of mind at a realistic price. The Profi Electric Pond Heaters are easy to install into your existing pipework. 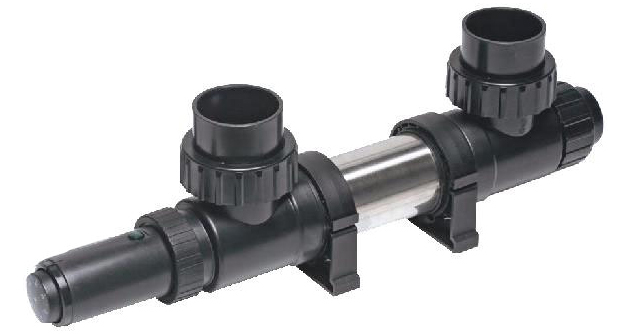 The Profi Electric Pond Heaters now come with couplings on the inlet and outlets allowing you to remove from the pipe runs. Comes complete with 3 m cable. It is very simple to fit these Profi Pond heaters into your system, and have it running, in just a few hours. The Profi Pond Heaters have a fully calibrated Thermostat for easy control of your pond waters temperature. Profi Heaters will appeal to all pondkeeper’s who prefer to retain the activity of fish during the winter months by increasing the water temperature. The Profi Pond Heater incorporates a stainless steel inner lining to the SS electric heating element, with a sturdy remote thermostatic controller box. WARNING: If your system is a PUMP FED system, then you MUST make provisions to be able to REMOVE THE HOSETAILS once per month to enable you to 'FLUSH' out the body of the Heater using the normal hose pipe. Failure to do this simple task will cause debris and waste matter to collect on the element which (if not removed) in time may cause the element to burn out.